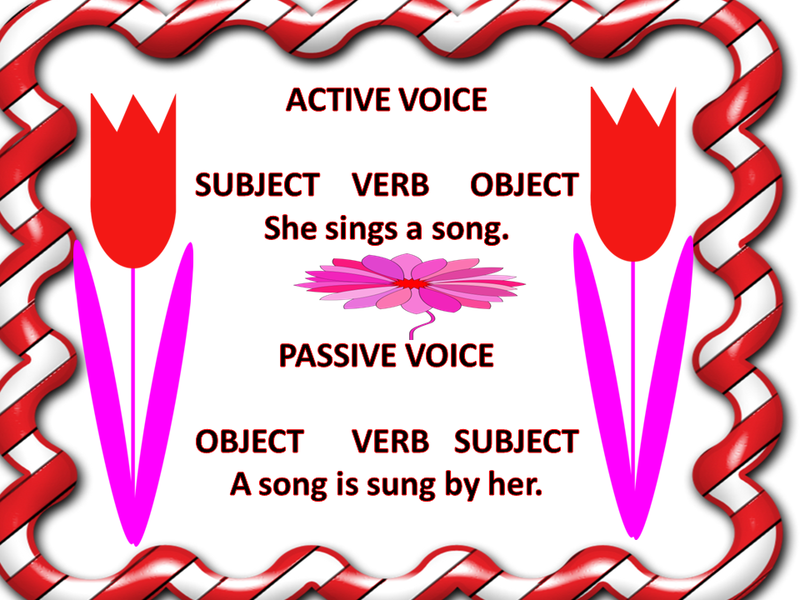 What is Voice – Active Voice & Passive Voice ? Why is voice needed? While communicating we use words in a sentence according to the importance ascribed to them. Or in other words are placed in a sentence according to their importance in communication. Usually a sentence has a subject, a verb and an object in it. A word is used as subject or object in a sentence according to the importance it carries with it. Take the following examples to make it clear. 1. I wrote a letter to him. 2. I wrote him a letter. 3. A letter was written to him by me. 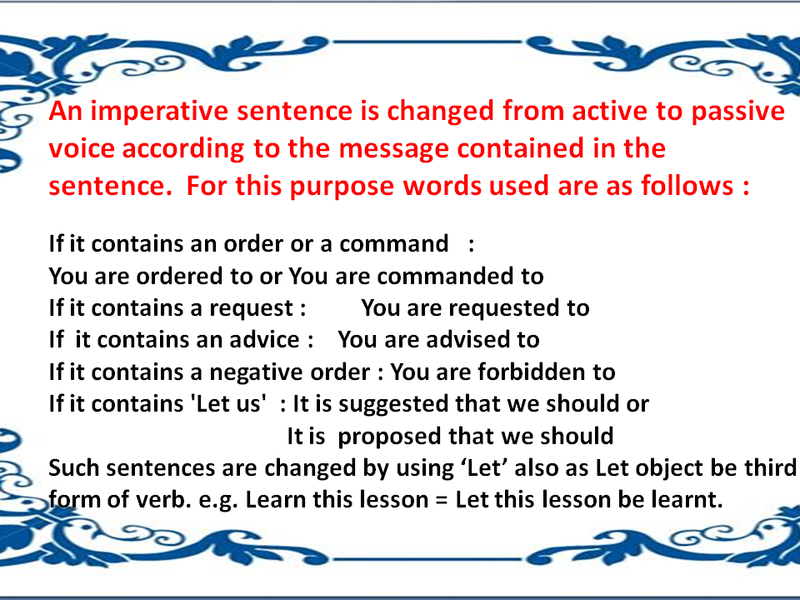 In these sentences the three key words I, letter and him are placed at different places in the sentences according to the importance of these words in communication. As such the two forms of voice i.e. 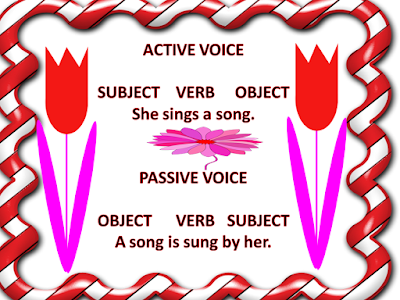 Active and Passive voice are used accordingly while communicating. 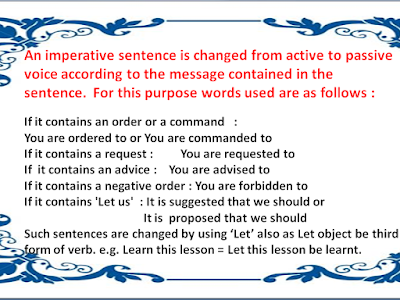 More important words are used as Subject and those of secondary place are used as an object in a sentence. For this necessary changes are made in the sentence. The process of making a change from active to passive form of a sentence is called ‘change of the voice’. Let +………. (object) +be + third form of verb. Open the door : Let the door be opened. Leave the room at once. You are ordered to leave the room at once. OR Let the room be left at once. Bring a glass of water for me. You are ordered to bring a glass of water for me. OR Let a glass of water be brought for me. You are ordered to go to market immediately. You are requested to help me. Please take pity on him. You are requested take pity on him. Please keep this book on the table. You are requested to keep this book on the table. You are forbidden to walk barefooted. It is time to revise the lesson. It is time for the lesson to be revised. Do not stand on ceremony. You are forbidden to stand on ceremony. Please do not disturb me. You are requested not to disturb me. Please do not eat raw fruit. You are requested not to eat raw fruit. It is time to say prayers. It is time for prayers to be said. You are advised to always speak the truth. You are advised never to tell a lie. You are advised to always respect your elders. You are requested to leave the room. It time to start the work. It is time for the work to be started. You are requested to fetch me a glass of water. Let your betters be respected. Let your work be started now. Let the window be closed. Let the poor be helped. Do not insult the beggar. Let the beggar not be insulted. Let your parents be obeyed. Let your own business be minded. Do not take overripe fruit. Let overripe fruit not be taken. Let us start our work. Let our work be started. It is suggested that we should start our work. Do not find faults with others. Send this message to him. Please speak a bit loudly. Always obey the rules of the road while walking. Fix a nail into this table. Attend to your teacher, please. Set out on your journey without delay. Solve these sums without any help. Do not abuse the children. Make haste to reach the station. Please keep to the left on the road. Check your mail box daily. Set the printer in order immediately. Go out for a walk in the morning daily. It is time to take the decision. Finish your work in time. Let us go out for a walk. Do not walk barefooted on the grass. Have faith in God and do the right. Let us discuss this topic threadbare. It is time to learn the lesson. Show the guests in , please. You are ordered to clean the floor immediately. OR Let the floor be cleaned immediately. You are forbidden to find faults with others. OR You are advised not to find faults with others. You are ordered to send this message to him. OR Let the message be sent to him. You are requested to speak a bit loudly. You are advised to take care of your parents. OR Let your parents be taken care of. You are ordered to fix a nail into this table. OR Let a nail be fixed in this table. You are advised to listen to him carefully. OR Let he be listened to carefully. You are requested to attend to your teacher. You are ordered to set out on your journey without delay. Please write your answers for exercise TWO and THREE in comments. We will review your answers.